So as well as being sweet & savoury, these are what I shall refer to as Storecupboard Macarons. Orange & fennel works extremely well with the almond already present in the classic macaron. 1/2 toothpick of orange food colouring gel, Sugarflair, Squires or similar. 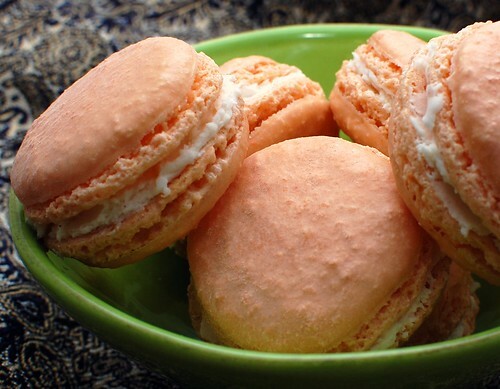 To prepare the macarons, whip the egg whites to a foam consistency using a handmixer. Gradually add the sugar until you obtain a glossy meringue and floppy peaks are formed. Sieve together the ground almonds and icing sugar and add the mixture to the meringue. Give it a quick fold to break some of the air and then carefully fold and combine until the batter sinks back into itself. The whole process should not take more than 50 strokes. Fill a pastry bag with the batter and pipe 2-inch rounds onto baking trays lined with baking paper or Bake-O-Glide sheets. Let the macarons sit in a cool place for 30 minutes to an hour to harden their shells. Preheat the oven to 150C and bake for 20 minutes, depending on their size. Transfer the Bake-O-Glide sheets from the baking trays onto wire racks and allow the shells to cool. If you have trouble removing the shells, pour a couple of drops of water under the parchment paper while the sheet is still a bit warm and the macarons will lift up more easily do to the moisture. To make the buttercream, beat together the butter (this must be soft, unless you like making life more difficult than necessary) and icing sugar together at a low speed. Once it has fully coagulated, continue beating at a medium-high speed for 3-4 minutes. Add the star anise paste, fennel powder and vanilla bean paste and beat for a further minute. Use the buttercream to sandwich the shells together. If possible, wrap in parchment and store overnight before serving. 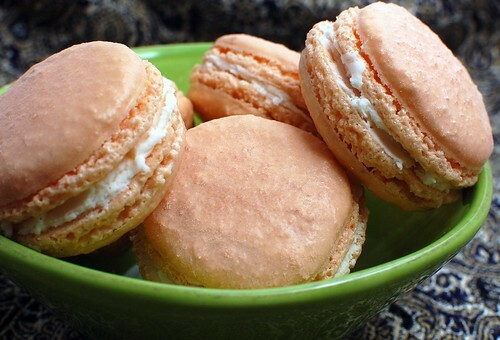 Interesting combination of orange and fennel for sweet and savory macarons. Nice frilly "feet" too! Thanks, I was particiuarly pleased with my feet this time round! I'm late visiting these but WOW they look splendid! Wonderful shape and colour and fennel sounds intriguing. I had a brilliant idea for this month but just hadn't got the time to make them this time round. Intriguing beyond belief...and oh-so-scrumptious Sally, I love how you worked the flavours into them! Thank you for joining us at MacTweets; it's wonderful to have you there. Apologies for this delay in stopping by... love your 'feet'!! Orange and fennel is a perfect combo, love it for a summer salad, so I can only imagine how lovely it tastes in shell form :) Beautifully done, and I could really use the Flavor Thesaurus! Thanks for linking! What a great flavour idea, I really love it! !